Two teams left. Quit playing around entertaining these other crap leagues you wont be a part of in the next 2 years. Hit me up at Sentinel2622@gmail.com if you want to see the team and the rules. Take care. Sure sure they are lol. LOL sorry kid (Hampson) Your're not old enough to play for COL. Trade Hampson now before your crappy owners realize whats happen. Tyler Nevin (son of Phil Nevin..who's an A-Hole btw) needs a tag on here. Surprised no to see one. Tyler is 21 with COL at A ball Lancaster in 2018. Hes got a great body at 6'4 200 lbs. Bats R Throws R and is at 1B. Comes with great pro pedigree and im sure that combined with his 2015 draft positions of 38th overall will allow him the time to succeed. So far he had a very solid season at A+ Ball in 2018. Batted .328 with 13 HR 62 RBI .503 SLG .889 OPS with no glaring K issues thus far. Had 4 SB but likely due to situational opportunity vs having good speed. So whats everyone think here? Have a shot to make it to COL as a 1B in the next 2-3 years? Yea dude for sure @The Big Bat Theory. All Knizner owners rejoice!! Gents why are poo pooing on Riley? Sounds like we are downgrading his stats verbally because Donny showed up... Look if Braves are in striking distance come late July, then no Riley. The moment two things happen Riley is coming up. 1. the Braves brass agree they dont have a shot at the playoffs they sell Donny and call Riley up. 2 the decent chance Donny gets hurt and Riley is up. 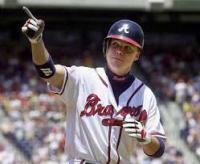 Strong chance ATL sells Donny, gets a good return and still calls up Riley at 3B. Lets pump the breaks on saying anything negative on Riley. Dude is 21 not 31 lol, 6'3 220 lbs with a milb career .294 ave with strong early signs of 55+ hit tool and 60+ power. Has the arm to play 3B no problem. ATL is not trying to shove him in RF with a future of Acuna in LF and Pache in CF. The farm is loaded with non 3B capable OF's to play right such as Waters/Jenista/ Demeritte/Wilson. Not to mention they can sign a long list of legit RF free agents this year or next if ATL needs too. Plenty of cap for that option. I for one and keeping my seat on the Riley train. Can we get a deeper look on this dude. I see conflicting things with McKay. Hes 22yrs old which is older for A ball. He didn't hit well enough to deserve a promotion to AA. However he did pitch well enough for a AA promotion. I see ETA's for him saying 2019? I also see ceiling remarks that make him sound crazy legit. hes ranked 24th on the pipeline top 100 (end of 2018 rankings). Do we believe hes getting a cup of coffee in 2019 with TB who is notorious for slow rolling talent to the show?? Thoughts gentlemen? Yep i picked him up last season mid way through. Everyone i show this dude to say WTF how did i miss stats like that lol. BUY NOW. I agree lol. The KID is 19 yrs old facing dudes who can throw 90+. We are to critical with stats on kids not old enough to have a dang beer as if that's what they will be when they are 24+. Bump. Nada on this fellas? I know last talk on Ward was 14 AUG but what do we think the chances are that he is LAA 2019 starting 3B? Can he stick there? Will he be given a real shot to break spring training with LAA? Love his Milb numbers and he did get 135 Ab's last year.